If you thought Bangalore was all about pubs and classy fine-dining restaurants, you might be in for a surprise. There are quite a few eateries in town which go beyond just offering you a satisfying meal. Going all out to create a unique experience for you with their special themes and decor, they are worth a visit, we think. So, from a forest to a Mughal-era setting, pick your favourite spot and head out for a meal with a difference. 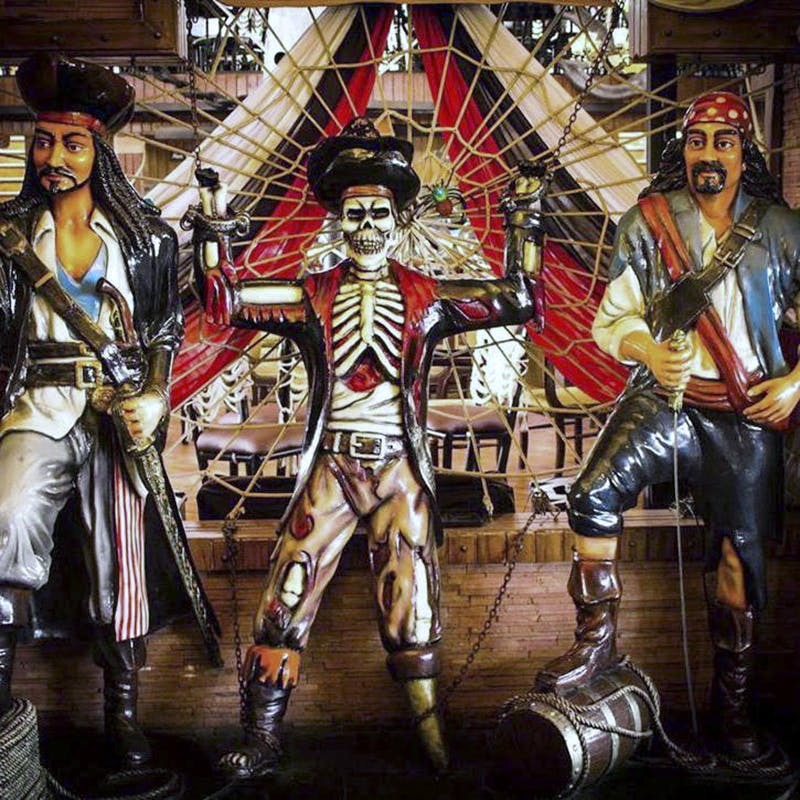 Whether you are a fan of the popular movie series, Pirates of the Caribbean or not, this one’s a must-visit for its theme. Fashioned after Captain Jack Sparrow’s ship, the staff here are also dressed as pirates! Get enough guts before you head here, though. From skeleton mannequins to chairs with human rib cages for back support, there’s quite a lot to test your grit. Once you’ve settled in, do try their juicy kebabs with some rum, perhaps? San Francisco’s iconic cable car system finds its way into the interiors of this themed restaurant. While the cuisines here (North Indian and Italian) might not be anything new, the place is bound to impress you with its decor. Apart from the walls filled with images of famous spots in the American city, the dining space has a cable car compartment which is where you must book your spot. Walk in and be transported to an army camp. Dine out of a tent, in a corner surrounded by war hero stories, community table, or from the bottom of a bunker, gas lights and all! The attention to detail is spot on with military water flasks pouring out drinking water and grenade shaped salt and pepper shakers, and staffed dressed in military gear! The serve food from across the country, but we'd recommend picking something from the meal plate (thali) menu for a bit of everything, especially if you're famished. Dimly-lit with flame torches on the walls and rocky interiors with a few sculptures, Gufha stays true to its name with its unique cave theme. Taking the ambience up a notch, there’s a subtle ripple of water playing in the background and even staff dressed up like hunters serving you North Indian specials. So, planning to cave in? Sporting an elaborate Middle Eastern theme, Ruh will make you feel like you’ve entered into a place right out of an Arabian Nights tale. Done up with elaborate chandeliers, candles and ornate mirrors (soft pink and blue lighting to set the mood, too), the restobar offers you a charming experience and lets you tuck into Mediterranean and Mughlai dishes. You can even sit back to enjoy a spot of hookah. Fancy escaping to a rural setting for your meal, without really leaving the city? Make way to Village and you won’t be disappointed. Set up like a typical village, you can expect familiar spots like a police thana and a Billo Barber saloon with a sprawling tree in the middle of it all. A cart, milk canisters and paper kites, all in vivid shades to give you the desi feel. They also have regular activities like puppet shows, games and dandiya dance to keep you engaged while you wait for the delicious fare. A Shakespeare themed resto-bar, the huge space with multiple types of seating is designed to look like medieval watering hole with bar fights and rambunctious performances! Roman sculptures, classical paintings, and wooden paneling (at least it looks like it) completes the look. As for food, they have everything from Mexican and Italian to Kodava and Mughalai cuisine (and a fair number of vegan options too), so take all your friends and family and ask them to bring a plus one! Touted to be the first jail-themed restaurant in town, Central Jail promises you a taste of prison dining. The model of an inmate welcomes you to your cell, and while the decor is eerie with hanging bulbs and exposed brick walls adding to the dingy effect, the food is not jail food. So expect Chinese, Mughlai and loads of seafood here. Oh, they even have numbered ‘prison cells’ for seating areas. Bangalore Box is made up of 10 shipping containers with the recycled decor stealing the show — missiles made out of oxygen tanks, spanners and wrenches for door handles, and fabrication sheets for floors. Seating inside is in the form of private booths and community tables in al fresco and rooftop options. The global menu features over 100 dishes so expect everything from Chinese to American and Italian to Indian. Drinks are potent and perfect for weekend shenanigans. A microbrewery and rooftop restobar, yellow submarine is inspired by the Beatles. They have a waterfall wall with a guitar, a walrus, and tentacles decorating the space to help you guess the songs they're going for. Submarine it may be called, it's more of a small cruise ship (sails and all!) over the sea of Bannerghatta Road traffic. Nautical decor, a giant submarine door to step in (or out, depending on how you see it), a cute bridge, and submarine lighting. enjoy the space while you enjoy craft brews and classic pub fare. They also host many a theme party; Harry Potter, Studio Ghibli, and Star Wars have influenced the menu during celebrations.